Druckmüllerized corona of 1 August published! 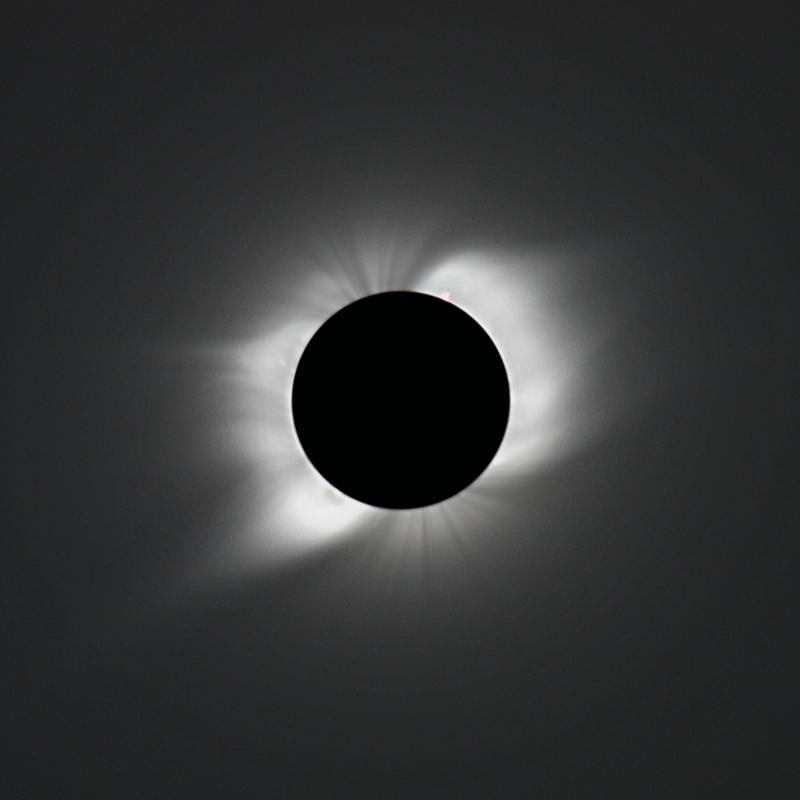 The first two results from a long-running project by Czech mathematician (and amateur astronomer) Miloslav Druckmüller regarding the total solar eclipse of 2008 - that the last two posts dealt with - have been published today! This particular kind of image processing which Miloslav (and his daughter!) developped from first principles of signal analysis is widely regarded as bringing out all the structure that the eye can see in the corona and more in just one image in which the extremely high dynamic range of the solar atmosphere is eliminated and fine - but real - structure enhanced mightily. One of the images shows the corona in all its glory with enormous detail and background stars down to 11th mag., the other presents the true colors of the corona with highly amplified saturation. More results (based on images obtained in Mongolia) will appear here in the future, and observers in other locations have also contributed data so that subtle changes in the corona over many minutes may have been documented. Another large collection of links to reports from the 2008 TSE - and the PLE two weeks later; this is how yours truly and numerous others saw it - will follow. ... have come in over the past seven days, so here's a new collection of links, as big as the initial one. The most unusual view is certainly this video from the edge of the totality zone, shot near Hami in China. We also have new corona composites here and here and a video of the Moon shadow from GEO orbit. Several more airplanes had views of totality than reported initially, e.g. a chartered one over Norway (parts one and two) or one from the Norwegian AirForce, while it was also seen from an airliner cockpit over Russia. From the Canadian charter flight here is the 'official' version of an already famous video as well as a report. And from the German polar flight we have another video, part 2 of a slide show, coverage by N24 and reports (more and more). From ships in the Arctic Sea only one more report has become available. From Russia there are a U.S. TV report and slide show, a video from Novosibirsk with several cameras (discussed here), another one and one from Akademgorodok, an animation of 2nd contact, widefield and close-up pictures, a composite of the contacts and numerous reports (more, more, more [more, more, more, more], more, more, more and more). From Mongolia there are videos (another one) and pictures. the "main" camp at Weizixia with pictures, a report, videos from people who ran away in search of a cloud hole and those who stayed put (while the hole came to them) and more exquisite pictures (more, more, more, more, more and more). Here are pictures from Yiwu downtown, a timelapse sequence and a video from between Yiwu and Hami. And from Gansu we have reports (more, more and more), another video and pictures (more). Additional material covers partiality in H-Alpha, impressions from Svalbard, strange physics and collections of further stories & links, esp. this one (German version). In other news the Perseids peak tomorrow, making the coming night and the one from Aug. 12/13 the best to watch - after midnight, when the Moon has set. It's not quite clear what to expect: The CBAT Electronic Telegram No. 1464 contains some inconclusive thoughts about Swift-Tuttle's dust trail form 1479 which may - or may not - cause some action at 5:30 UTC on Aug. 12 and other possible rate enhancements. So: Watch the skies - or the visual data quicklook where the rate is already going up steadily. No part of the Perseids was a nice New Mexico fireball of Aug. 4, by the way. 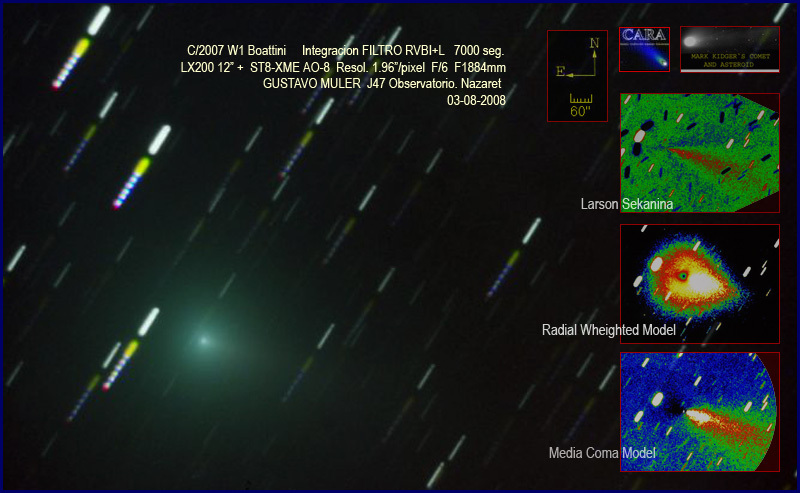 • Comet-wise there are Boattini images of Aug. 10, Aug. 3 and Aug. 2, Lulin images of Aug. 2 (animation), July 29 and July 24 and D'Arrest images of Aug. 3 and July 25. • There is a call for observations of Eta Carinae which has started a new spectroscopic event which returns every 5½ years - a piece of evidence for a binary system. 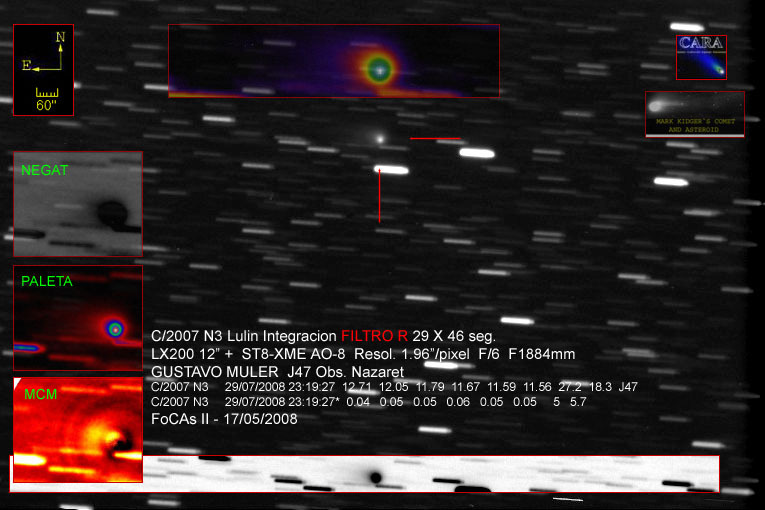 • The famous Hanny's Voorwerp story, all over the news, has now even produced Yale and Oxford Press Releases - rarely do amateur astronomical chance discoveries have such an impact on pro astrophysics. 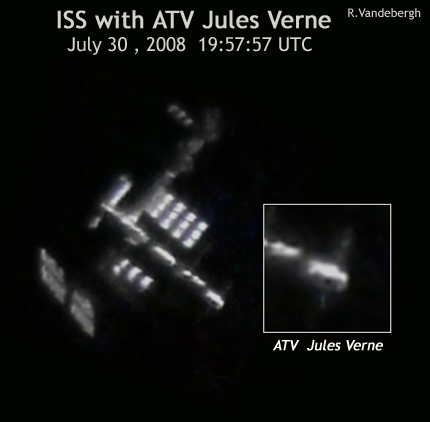 • There are more ISS images of July 30, 27, 25 and 24 (more), Stardust@Home hasn't found an interstellar particle yet, and the HST celebrates 100,000 orbits. As with the previous total solar eclipse in 2006 the view was clear along much of the track of totality during the TSE of 1 August 2008 - from places in the Arctic sea (with dismal weather stats) through Russia, Mongolia and China where the eclipse was even visible a few degrees above horizon in its central region. And there were even two eclipse flights, originating in Germany and Canada. Three days later the web is full with early impressions and detailled reports - and it became clear that the corona's shape had been predicted very well several days ahead, as a comparision with a first composite by Lüthen (explained here) shows. There are now picture galleries by SpaceWeather, S&T, LA Times, Welt, Chicago Tribune, Tagesschau and even the Huffington Post - and radioastronomical amateur observations of the partial phase. Individual links follow, sorted by region along the track. From the Arctic we have Staiger's videos 1, 2 and 3 (nice emotions :-), pictures by ShadowChaser and coverage by Sueddeutsche (but the guy's real name is Strickling). 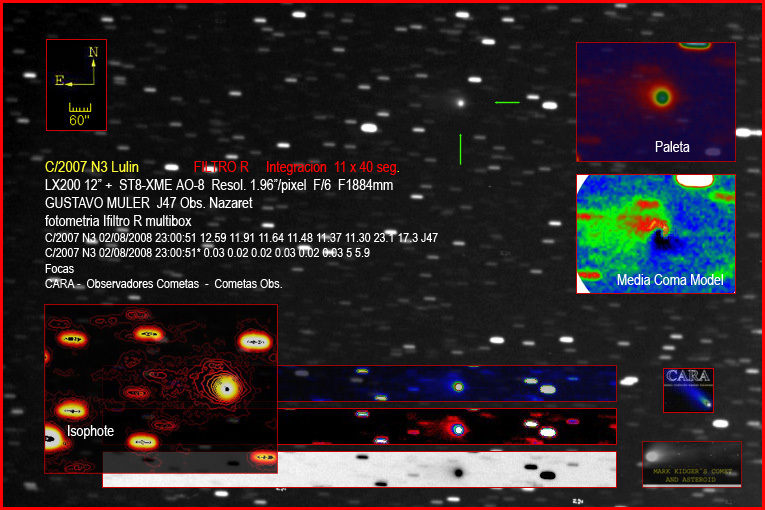 From Russia, the easiest location in the totality strip, there are reports and results by Pasachoff and Neumann (discussion), a video (discussed here), pictures by Ayiomamitis (processed corona), Göller (more), Shamilek and Chasiotis and coverage by Novosti, AP, RusslandOnline and Aktuell. From Mongolia (with difficult communications in the remote eclipse zone) we have already reports and pictures by Bruenjes, Sims (fine multiple image over landscape) and Flanagan. travelogues by Krause, Ewers (nice pics from near where yours truly was), SEMS (featured in the low video above) and Grupo Saros and pictures by Yen (with one cloud in the wrong spot) and Kato. And coverage by Xinhua (preview), China Daily (more; pictures), CCTV, China.org, Irish Times and DLF. From the German polar flight exist striking timelapse videos shot from the right and left side of the plane, a narrated slide show and a photo album, a composite photo by Kraemer (processed by Schneider), a TV news clip by ZDF and coverage by Space.com. The Canadian eclipse flight resulted in a somewhat shaky but even better video and a report with further still pictures (pre-take-off story). And finally from Central Europe and Western Asia (where the eclipse was only partial) reports have come in from the ROG, Karrer (with hi-res lunar limb detail), Paleske (dito), Dangl, Holzeis (prominence detail), Engert, Pikhard (public event), Psy and from Heuchelheim, Greenwich and Zurich, with coverage by NDTV, PNP (nice snapshot), RP (with 27 pics), NewsClick, Aachener Nachr. and SPIEGEL. General coverage of the eclipse (covering its impact in several places) was provided by Sky & Tel., LA Times, MSNBC, BBC, CNN, AP, IB Times, Bild (with Reuters video, also here), Sat1, N24 (with other video), T-Online, DPA, News and in this video. And there was even an unusual view from space, explained here.